Editor’s note: Tucson Guide’s “52 Things to Do” are listed in no particular order. All information given here was accurate at press time. You may want to phone for confirmation prior to visiting these attractions. Bibliophiles, rejoice! This 10th annual celebration of literacy and reading (held March 2 and 3) attracts more than 400 authors from around the country, including Greg Miller, Ron Stallworth, Jane Leavy, Nafissa Thompson-Spires, and Sigrid Nunez; more than 250 exhibitors; and 30 venues at The University of Arizona, including 5 outdoor stages. It’s the largest literary event ever held in the state. A full weekend of activities includes author lectures, readings, writing contests, panel discussions, and workshops. Booksellers, publishers, and literary organizations for wordsmiths of all ages will also be on hand. All proceeds benefit the advancement of literacy in Southern Arizona. The Crown Jewel of Downtown, a meticulously restored 1930s Art Deco theater, has a proud tradition of bringing Tucson together by providing world-class entertainment. This year, the Fox is launching its biggest season ever with a variety of artists from industry legends to exciting newcomers. Music ranges from country, indy, Americana, world music, comedy, classic rock, and more, along with hilarious comedy and titillating variety shows. If you need even more incentive, don’t forget the classic movies! There’s something thrilling about seeing your favorite classic 35mm film on the big screen in the intimate atmosphere of the Fox. The Pima County Fair, April 18–28, 2018, is one of Tucson’s oldest and largest annual events with more than 325,000 visitors. Cost for admission is $9, and fairgoers can enjoy the concerts, rodeo, crafting, interactive exhibits, animal attractions, car shows, and equestrian events, all included with the low price of admission. Visitors to the Pima County Fair also have the opportunity to sample and enjoy the famous fair food that only comes once a year, such as giant turkey legs, funnel cakes, and deep fried treats. If Tucson was a party, downtown would be a suave, smart and cultured party goer, but Fourth Avenue would be its funnier, funkier energetic hippie twin sibling. Historic Fourth Avenue is the life of the party, the cool, crazy uncle of the Tucson family, cut from the same cloth as downtown… but dipped in some tie-dye. The vibrant thoroughfare is home to quaint and creative small businesses, tasty and original eats, dive bars that double as art galleries and much, much more. Take an evening stroll during deal-tastic Fridays on Fourth or the bustling Fourth Avenue Street Fair for nightlife as flavorful and spicy as B Line Cafe’s salsa. On the first Thursday of every month, the Tucson Museum of Art is free and open to the public from 5 to 8 p.m. Join TMA for exciting evenings featuring live music, performances, art-making activities, unique gallery experiences, and a cash bar serving local beer and wine. Named One of the Great Botanical Gardens of the World by Travel + Leisure, Tohono Chul is nestled in 49 acres of lush desert. You’ll discover nature paths, gardens, art galleries, shops, and a tasty meal at the Garden Bistro. It’s always cool at The Mini Time Machine Museum of Miniatures with more than 10,000 square feet of air-conditioned exhibit space, showcasing antique and contemporary miniatures. This summer, check out the new exhibit Borrowed Time / Borrowed Books by Baltimore metal and miniature artist Jill Orlov. And be sure to visit the website for information on special programs like Kids Create, Tiny Tales for Tots, or Tinker Workshops. The Pima Air & Space Museum is one of the largest aviation museums in the world and TripAdvisor ranks it in the Top 10% worldwide. Its significant collection, 350 strong from around the globe, covers commercial, military and civil aviation. See all-time great aircraft on its 80 acres: the SR-71 Blackbird, a B-29 Superfortress WWII fighter planes, three B-52s, a Boeing B787 Dreamliner, the world’s smallest bi-plane, planes used as renowned contemporary artists’ canvases, and much more. There are daily, guided walking and tram tours of the grounds and the galleries. We also offer exclusive motorcoach tours of the world-famous 390th AMARG Military aircraft storage facility AKA The Boneyard. You’ll want to book your return before you leave after you eat a peach, pick a pear, or squeeze a grapefruit from some of our 600+ fruit trees during your quick getaway to our nature-lover’s paradise an hour north of Tucson. Aravaipa Farms Orchard & Inn is an experience of a lifetime for hikers, birders, and photographers alike. Get your feet wet hiking one of Arizona’s top riparian canyons or take a dip in our pool. Slumber soundly in any of our five charming casitas or farmhouse after a great meal served by innkeepers who cater to every guest. Call Laura at 520-261-7373 or email info@aravaipafarms.com. The Darndest Place You’ll Ever Visit! Voted one of the best roadside attractions in America. Come get a hands-on experience like no other at this extreme petting zoo. Have fun with the goofy ostriches, miniature donkeys, rainbow lorikeets, goat kissing booth, bunny exhibit, stingray hand feeding, and more. It is laugh-out-loud fun for all ages! On I-10 and exit 219 at Picacho Peak. Close to 7,000 feet in elevation and located on the Tohono O’odham Reservation, Kitt Peak offers a cool summer getaway. Open daily 9 a.m.– 3:45 p.m., the observatory is the world’s largest. Daily telescope tours; visitor center with exhibits and gift shop. 15–20° cooler temps await you. Stargazing programs run nightly but are closed July 15–Aug. 31 due to monsoons. Experience the joy of play-based learning at Children’s Museum Tucson and Oro Valley! Downtown, find 13 rooms with fun, interactive STEM- and art-based exhibits. In Oro Valley, specially sized for kids 0–5, experience tactile and sensory exhibits that encourage exploration. Always something new! Downtown and Oro Valley. Discover your inspired, creative spirit with Santa Theresa Tile Works’ colorful, handmade tile. Whether you craft a mosaic plaque, table, or backsplash in our cozy showroom, take one of our many workshops, or learn to make tile from scratch—you will amaze yourself! Prefer to keep your hands clean? Collaborate with one of our experienced and talented tile artists and design a custom-made piece for your home or business. Any way you tile it, it’s sure to be fun, memorable, and amazing! A truly authentic Tucson arts experience. All proceeds directly benefit the students of Imago Dei Middle School. Longtime Tucson artists William Skiles and Lisa Stotska welcome visitors to experience a taste of local artists’ talents and purchase signature handcrafted interchangeable jewelry. Choose what marble or gem you want to wear from the patented jewelry designs—a masterpiece of design and engineering. Pop the stone out and pop a new one in. Choices of marbles include gemstones, precious metals, Murano glass, and created opals. There is a wide range of jewelry products—pendants, earrings, bracelets, and rings. If you are looking for a memento or something special for a certain someone, the shop has what you need. Something is always happening at Wilde Meyer Gallery. The gallery presents continually changing exhibits of original fine art paintings and sculpture. Don’t miss touring our smalls works rooms where our talented gallery artists show small pieces. We also have a great selection of fine crafts, handcrafted one-of-a-kind jewelry, silver Taxco jewelry, ladies accessories and fashion pieces that are truly art to wear. See the three monumental sculptures on the southwest corner of Skyline Dr. and Campbell Ave. at one of Tucson’s few sculpture gardens. Follow the sculptures around the building (under the copper dome) to see the whimsical ceramic totems, fused glass-and-steel sculptures, repurposed steel bells, and giant colorful animals that live here. At the end of the building, behind the fountain, is the sculpture garden. Kinetic copper pieces and stone-and-steel pieces are displayed at Jane Hamilton Fine Art. Want to see some beautiful pieces made in the desert Southwest and have a great time? Come to Arlene’s in Tombstone and you will find a fantastic selection of Native American-made items, including locally made Tohono O’odham baskets. Located southeast of Tucson in Tombstone, see what is generally regarded as the most famous gunfight in the history of the American Old West. The fight took place on October 26, 1881, between Doc Holliday, the Earp Brothers, McLaurays, and Clantons, and has since come to represent a time in American history when the frontier was an open range for outlaws roaming the vast West. Nestled quietly just north of Tucson, the town of Marana is an ideal place to set up base camp. Close to it all, from Marana you can get right into the gorgeous outdoors and disconnect but you’re still close enough to amazing shopping, dining, and entertainment in town or just down the road in Tucson. Reid Park Zoo, an AZA-accredited zoo, is home to more than 250 animals from around the world, including tigers, anteaters, lions, flamingos, grizzly bears, elephants, rhinos, and more! Learn how you can help protect wild animals and wild places while you explore naturalistic habitats, watch our Animal Care staff give training demonstrations throughout the day, or schedule a behind-the-scenes tour prior to your arrival. The Zoo is centrally located within Reid Park. Hike, bike, horseback ride, or cross-country ski on 800 miles of interconnecting trails through the Coronado, Tonto, Kaibab, and Coconino National Forests, from the border of Mexico to Utah. Of course, shorter jaunts along the Arizona Trail near Tucson are beautiful, too. For authentic Mexican food, beautiful scenery, and the hottest salsa, follow the fiery flavors of Arizona’s Salsa Trail. The trail stops at restaurants, a chile company, and a tortilla factory. Think you can handle the heat? Pack up the kids and head out the door, because Arizona is perfect for enjoying the great American pastimes of miniature golf, bumper boats, batting cages, go-carts, and video arcades. There’s nothing wrong with a little family-friendly rivalry to get that high score. Visit Funtasticks Family Fun Park at 221 E. Wetmore Rd. or Golf N’ Stuff at 6503 E. Tanque Verde Rd. The U of A campus boasts a collection of plants from all over the world. The Visitors Center, at Euclid Ave. and University Blvd., has maps directing you to the highlights. Built in 1896, the cathedral is reminiscent of European church architecture. Every Sun. the clergy conduct mass accompanied by live mariachi music. 192 S. Stone Ave. While in town, hop on board the Sun Link Streetcar and visit more than 100 restaurants, bars, shops, and museums in five of Tucson’s unique entertainment districts. Sun Link’s 23 stops offer a variety of fun things to do in the heart of Tucson. To ride, download a 1-Day Pass or Single Boarding Fare on your smartphone at GoTucsonTransitApp.com, or purchase a 1-Day Pass at a ticket vending machine located at each street-car stop. Cash is not accepted once on board Sun Link. This takes some driving—168 miles of it—but it’s worth it. Take AZ Hwy. 86 west to the tiny town of Why. Turn left on AZ Hwy. 85 to get to the monument headquarters. When you get to Organ Pipe, drive or hike through the 516.7-square-mile preserve of rare cacti. Explore the depths of Bisbee’s famous Queen Mine. Don mining hats, slickers, and lanterns worn by miners…ride the mine train deep into the mine…marvel at remaining copper minerals…experience the life of miners as they toiled in the subterranean tunnels. Open daily. Tour times: 9 a.m., 10:30 a.m., noon, 2 p.m., 3:30 p.m. Tours leave from the Queen Mine Tour building located within walking distance of historic Bisbee. The mine is cool, so please dress accordingly. Tours last approximately 1 hour and 15 minutes. Reservations suggested. Call 866-432-2071 or visit queenminetour.com. Stop by the Queen Mine Store for gem and mineral specimens, jewelry, and other unique items. Visit discoverbisbee.com for official visitor information. Ninety miles south of Tucson, Bisbee offers Old World charm and new-world charisma. Toy-train aficionados will want to make a stop at the Gadsden-Pacific Division Toy Train Operating Museum (520-888-2222, gpdtoytrainmuseum.com), with more than 6,000 square feet of displays and detailed scenic tracks. Located at 3975 N. Miller Ave., near N. Romero and W. Roger Rds., it’s a little hard to find but well worth the effort. Attractions include old telegraph equipment and other historic memorabilia, including hundreds of toy trains that date back to the 1940s. Call ahead for days and hours of operation. Next stop—fun! The free Splash Pad at Brandi Fenton Memorial Park (3482 E. River Rd.) features a large concrete pad with water buckets, hoses, fountains, and other water features to beat the heat. The Amerind Foundation Museum contains a fine collection of archaeological and ethnographic materials, with an art gallery featuring works by Native American artists. Located an hour east of Tucson, in the spectacular rock formations of Texas Canyon. When shutterbugs imagine heaven, it has the same light and the same photo opportunities as Arizona. From Ramsey Canyon hummingbirds and the Pima Air & Space Museum to old homes in the barrios and the Tucson Arts District, Southern Arizona invites camera buffs. Capture nature at the Arizona-Sonora Desert Museum and Tohono Chul. This is a year-round activity in Tucson. If you’re staying at a hotel, you’ve probably got a pool with lots of lounge chairs. But if by chance you don’t have a pool where you’re staying, try the many city-operated pools available to the public, but don’t go without sunscreen! Tucson probably offers more leather goods than any place you’ve visited. Belts, billfolds, purses, cowboy hats, and—most of all—boots. Tucson is the place to find it all! Situated 45 miles south of Tucson, Tubac was once the site of a Spanish presidio. Today it offers golf, restaurants, lodging, art galleries, and more. The nationally acclaimed University of Arizona’s Poetry Center has more than 60,000 books, periodicals, and recordings in its exhilarating home at 1508 E. Helen St.
Head downtown to explore Tucson’s historical landmarks on this self-guided walking tour. The 2.5-mile trail takes you to 23 sites, including Hotel Congress and the Fox Tucson Theatre. Pick up a free map at the Visit Tucson’s Visitor Center. Dedicated to promoting positive bicycle use, Bicycle Inter-Community Art & Salvage (BICAS) is a nonprofit community cooperative. It creates and sells items made out of old bike parts, assists with repairs, and offers classes. Don’t miss the reconditioned used bikes available for reasonable prices. Warm nights, stirring sunsets, dark starry skies—we don’t advertise it, but these are some of the things that keep residents in Tucson year-round. Enjoy dusky moments at Gates Pass, “A” Mountain, the Santa Catalina foothills—or explore and find your own spot. Enjoy narrated tours through the place where mammoths roamed, ancient Hohokam people made irrigation dams, and the Civilian Conservation Corps built bridges and cut hiking trails. Trams run daily, with multiple stops, including one at the trailhead of a hike to Seven Falls—a definite Tucson must-see. Located on N. Sabino Canyon Rd. How much of the environment (and money) would we save if we all traveled by rail? That’s one of the questions posed at the Southern Arizona Transportation Museum, located in the renovated historic train depot in downtown Tucson. Here, visitors can contemplate the pros and cons of alternative transportation, practice Morse code as the conductors of the railroad once did, view historic artifacts and photos, and visit the restored 1900s locomotive parked trackside. Ever see a handcranked stamp dispenser? How about a letter bag from the days when letters traveled by rail? The Postal History Foundation features a 19th-century post office and showcases all kinds of post-office antiques. The museum, at 920 N. 1st Ave., is open for tours from 8 a.m. to 3 p.m. Mon.–Fri. ; tours last about half an hour. The Peggy J. Slusser Philatelic Library, featuring postal history and Civil War books, is open 9 a.m.–3 p.m. Mon.–Fri. If you enjoy fresh food, fresh air, and friendly faces, a farmers market may be just the place for you. Find seasonal fruit and vegetables, herbs, arts & crafts, gourmet soups and sauces, coffee, baked goods, and more throughout the city. They dot the landscape of Southern Arizona, remnants of 19th-century mining days. A short drive from Tucson, near Patagonia, you’ll find what’s left of Harshaw, Washington Camp, Mowry, Duquesne, and Lochiel. In the Tombstone/Bisbee area, you can visit more than 14 different ghost towns, including Pearce, Gleeson, and Charleston. A permanent exhibit at the Arizona State Museum, Paths of Life, takes an innovative look at contemporary native cultures. Explores the histories of 10 regional Native cultures in a fascinating mix of life-size dioramas, prehistoric artifacts, and historic objects. Located just east of the Main Gate on the U of A campus (at Park Ave. and University Blvd.). Known for its incredible volcanic rock formations, “Land of the standing-up rocks,” was once home to Geronimo and Cochise. Find more than 20 campsites and 22-plus miles of hiking and horseback-riding trails. Chiricahua National Momument is located 36 miles southeast of Willcox on AZ Hwy. 186. 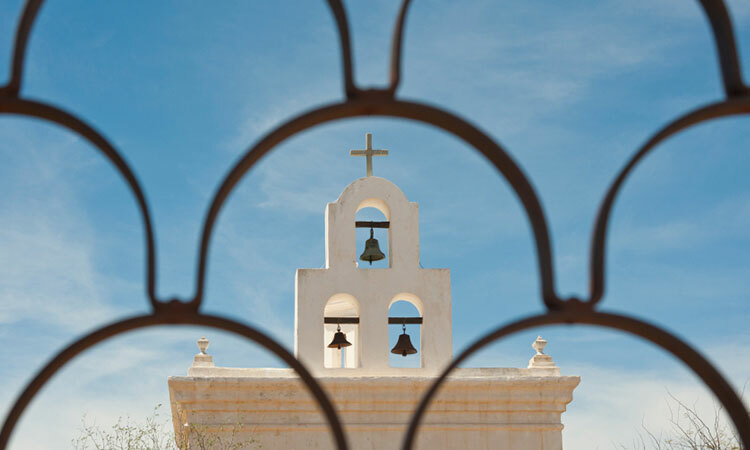 Called “The White Dove of the Desert,” the San Xavier del Bac mission was founded by Father Eusebio Francisco Kino in the late 1600s. The church, built by the Franciscans in the 1700s, is one of the finest examples of Spanish mission architecture in the US. Visitors can enjoy the results of a major restoration, portions of it by experts who restored the Sistine Chapel. Take I-19 to exit 92, then watch for signs once you get onto the Tohono O’odham reservation. Just 12 miles north of Tucson on Oracle Rd. (AZ Hwy. 77), this park offers the best views of the canyons, cliffs, domes, and spires on the north side of the Santa Catalina Mountains. White-tailed deer abound. Walk the Romero Ruin Interpretive Trail to the archaeological site of an ancient Hohokam village that was later a Spanish hacienda. Picnicking, camping, biking, and hiking are available. Explore the scientific wonders found only in Southern Arizona. From viewing native plants and animals at the Arizona-Sonora Desert Museum, to stargazing with The University of Arizona’s Mt. Lemmon SkyCenter, this region offers a wealth of scientific discoveries. Don’t miss cave exploration at Kartchner Caverns, too, and Biosphere 2’s climate zones beneath the dome.